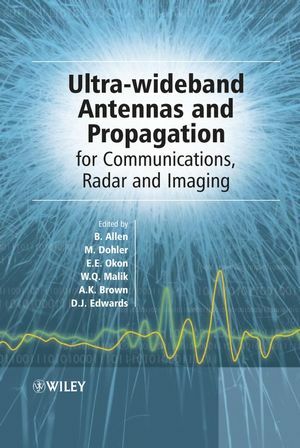 Providing up-to-date material for UWB antennas and propagation as used in a wide variety of applications, "Ultra-wideband Antennas and Propagation for Communications, Radar and Imaging" includes fundamental theory, practical design information and extensive discussion of UWB applications from biomedical imaging, through to radar and wireless communications. An in-depth treatment of ultra-wideband signals in practical environments is given, including interference, coexistence and diversity considerations. The text includes antennas and propagation in biological media in addition to more conventional environments. The topics covered are approached with the aim of helping practising engineers to view the subject from a different angle, and to consider items as variables that were treated as constants in narrowband and wideband systems. The book highlights the unique design issues of using ultra-wideband and will serve both as an introductory text and a reference guide for designers and students alike. Ben Allen completed his MSc and PhD degrees at the University of Bristol, U.K., in 1997 and 2001 respectively.Having undertaken post-doctorial research in the areas of smart antennas andMIMOwireless systems, he then became a lecturer at the Centre for Telecommunications Research, King’s College London where he co-founded the UWB research group. He is now with the Department of Engineering Science, University of Oxford. He has published numerous journal and conference papers in the above areas as well as a book on smart antennas. He has been in receipt of the IEE J Langham Thomson Premium and the ARMMS Best Paper Award, both for publications relating to UWB. He is a senior member of the IEEE, chartered engineer, member of the IEE, and a member of the IEE’s Professional Network Executive Committee on Antennas and Propagation. Mischa Dohler obtained his MSc degree in Telecommunications from King’s College London, UK, in 1999, his Diploma in Electrical Engineering from Dresden University of Technology, Germany, in 2000, and his PhD from King’s College London in 2003. Hewas a lecturer at the Centre for Telecommunications Research, King’s College London, until June 2005. He is now a Senior Research Expert in the R&D department of France Telecom working on cognitive and sensor networks. Prior to Telecommunications, he studied Physics in Moscow. He has won various competitions in Mathematics and Physics, and participated in the 3rd round of the International Physics Olympics for Germany. He is a member of the IEEE and has been the Student Representative of the IEEE UKRI Section, member of the Student Activity Committee of IEEE Region 8 and the London Technology Network Business Fellow for King’s College London. He has published over 50 technical journal and conference papers, holds several patents, co-edited and contributed to several books, and has given numerous international short courses. He has been a TPC member and co-chair of various conferences and is an editor of the EURASIP journal, the IEEE Communication Letters, and the IEEE Transactions on Vehicular Technology. Ernest E. Okon received the PhD degree in Electronic Engineering from King’s College London in 2001 and the MSc (with distinction) and BSc (honours) degrees in Electrical Engineering from the University of Lagos in 1996 and 1992 respectively. His research interest is in electromagnetic modelling techniques, wide band antennas and arrays, sensor networks and RF circuits and devices. He taught undergraduate and postgraduate courses on antennas and propagation whilst at King’s College London. He joined BAE Systems Advanced Technology Centre UK in 2001 and is currently a research scientist working on electromagnetic problems, MEMS, antennas and arrays. He has written numerous reports, and published journal and conference papers. He is a member of the IEE, IEEE and Optical Society of America. He is also listed in Who’s Who in the World, Marquis USA. Wasim Q. Malik received his DPhil degree in Communications Engineering from the University of Oxford, UK, in 2005. Since then, he has been a Research Fellow at the University of Oxford, where his research focuses on ultrawideband propagation, antenna array systems, cognitive radio, and nanoscale sensors. He also holds a Junior Research Fellowship in Science at Wolfson College, Oxford, where he researches microwave tomographic imaging. Dr. Malik has published over 50 research papers in refereed journals and conferences, and has delivered keynote and invited talks at a number of conferences. He is a Guest Editor for the IEE Proceedings on Microwaves Antennas and Propagations forthcoming special issue on “Antenna systems and propagation for future wireless communications”. He has also been the General Co-Chair and Technical Program Committee Member at several international conferences. Dr. Malik received the Best Paper Award in the ARMMS RF and Microwave Conf., UK, Apr. 2006, the Recognition of Service Award from the Association for Computing Machinery (ACM) in 1997, and won the National Inter-University Computer Science Contest, Pakistan, in 1998. He is a member of the IEEE and the IET, and serves on the UK Task Group on Mobile and Terrestrial Propagation. Anthony K. Brown is a Professor in Communications Engineering and leads the Microwave and Communication Systems research group at the University of Manchester (UK). He joined academia in 2003 having spent 28 years in industry, most recently for Easat Antennas Ltd where he is retained as company Chairman. He is a recognised expert in antennas and propagation as applied to radar and communications systems. Professor Brown is a member of the Technical Advisory Commission to the Federal Communication Commission (USA)- and is a UK representative to the EU’s COST Action 284 Management Committee. He has advised various international bodies including in Canada, Malaysia and USA. He has been a Steering Board member of the Applied Computational Electromagnetics Society (ACES USA), and is past recipient of the Founders Award from that organisation. He has served on many national and international committees (including for IEEE and IEE, EUROCAE and ARINC). He was a founder member of the EPSRC Communications College. Professor Brown is a frequent invited lecturer on antennas and related topics, most recently including application of such techniques to Ultra Wide Band communications. He is a listed expert on UWB systems by the Paris Ultra Wide Band Organisation (http://timederivative.com/pubs.html). Prof Brown is a Fellow of the IEE and the IMA and is a Charted Engineer and Mathematician. David J.Edwards has been an academic for 17 years after 12 years spent in the industry (BritishTelecom). He has a strong record of innovation in communications systems, electromagnetic measurements, ground probing radar and subsurface imaging radar. He has authored or co-authored in excess of 200 publications in his time as an academic. He has been in receipt of a number of awards and prizes (IEE Prize for Innovation, NPL Metrology award, IEE Mountbatten Premium (2 papers) and IEEE Neil Sheppy prize) for his work and has been extremely well supported by funding from research councils, industry and government agencies. He has a track record of wide collaboration within theUKand internationally. Prof. Edwards is serving and has served on a range of international committees in communications and related fields. He is a Fellow of the Institution of Electrical Engineers and a Fellow of the Royal Astronomical Society.